I've spent the past two weeks knocked out by the flu (this would be the year I didn't get the flu shot) which at least gave me something else to think about besides the Bowie Dance Party - when you're running a fever for 4 days straight, you stop caring about whether anyone came to your party or not. Anyway, aside from the lingering cough, I seem to be getting better which meant it was time to write something. 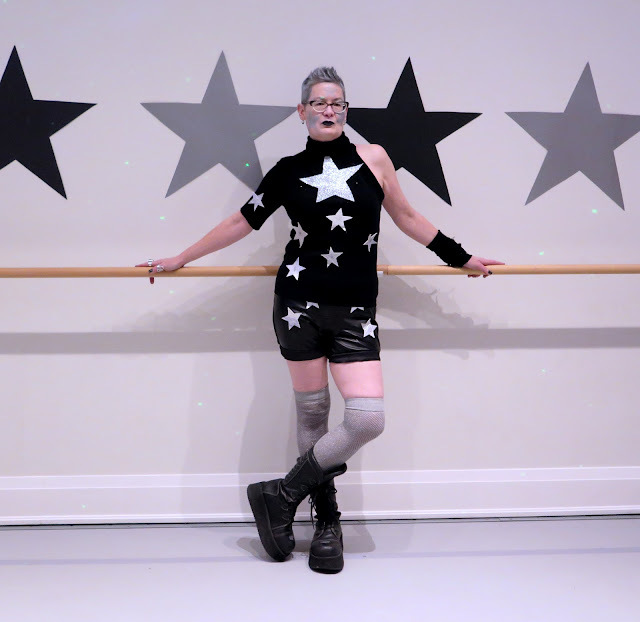 When I first announced I was having a David Bowie Dance party, lots of people told me what a great idea it was, and how they were looking forward to being there. After all, there are lots of David Bowie fans everywhere, even in conservative London, Ontario, right? When you are offering treats, prizes, and a great music performance for the paltry sum of $5, how could people not want to come? It was promoted all over the media, including two local radio stations, in the Downtown London newsletter, the local paper, and shared all over Facebook. I put up posters all over downtown and handed out cards advertising the event. Even though everyone who hosts an event knows there's a risk that no one will show up, nothing prepared me for the moment when it was 15 minutes after the advertised start time of the party, and only three people had turned up. My heart plummeted to the soles of my platform boots. Heather kept patting my shoulder and saying "more people will come". 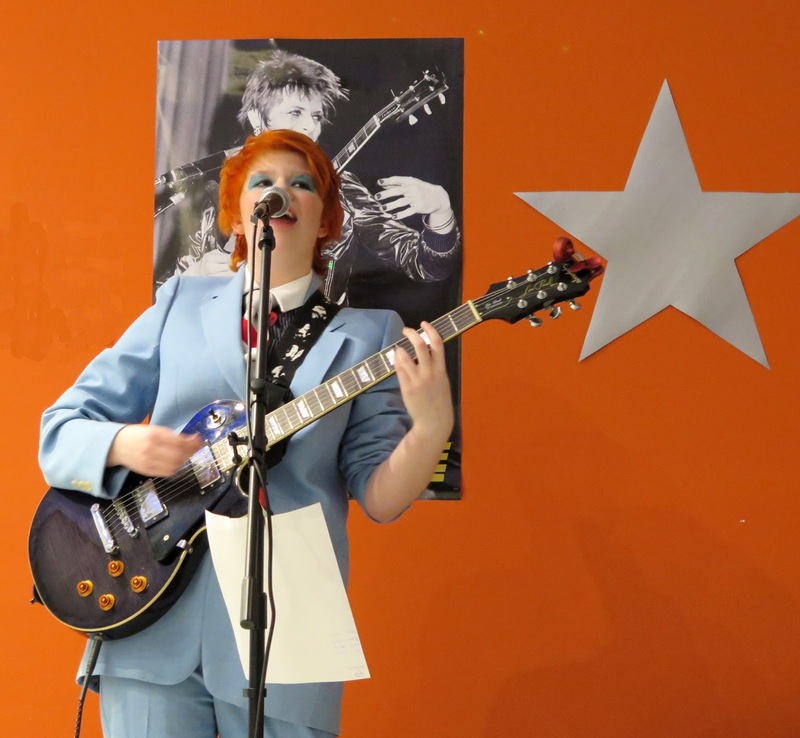 And she was right, but the event I envisioned as an occasion to bring together Bowie fans here in London to celebrate his creative genius turned into a small get-together for the wonderful group of friends who support all (or at least most) of my hair-brained schemes. 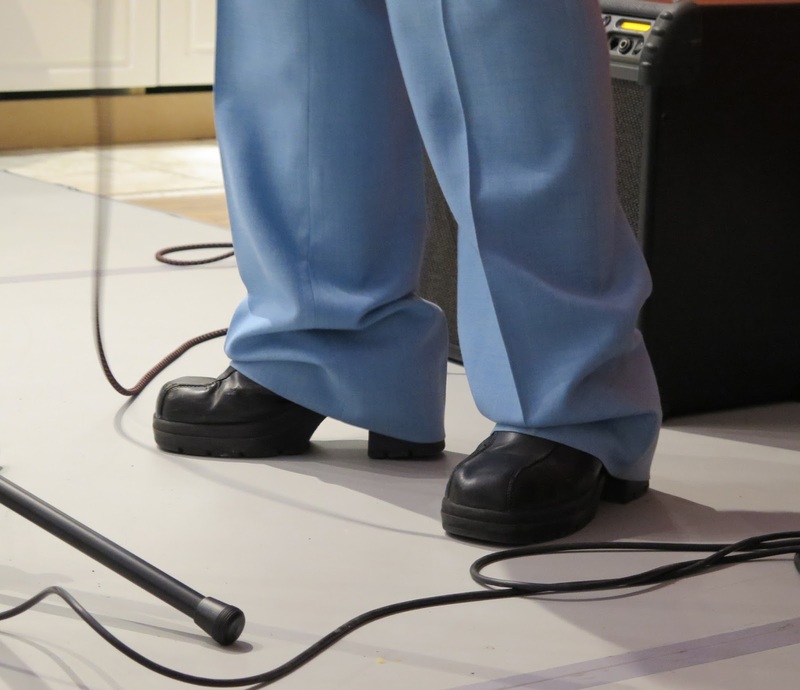 Of the 35 people that came, there were a few people I didn't know, including a lovely woman around my age, a fan of my blog, who came by herself and proceeded to dance to every song. A work colleague brought her 5 year old daughter, who seemed to think it was a great party. And in fact, that seemed to be the general opinion of the people who were there, so to all of you, who for one reason or another decided not to come, you missed a good party. I asked Heather to take a photo of my costume while we were setting up, and it turned out to be the only photo I have of me from the evening. I was The Star(Wo)Man, and although it's hard to tell from the photo, I had silver stars painted on my face. My best pal, who had spent weeks driving me all over to pick up supplies, was there that night to help with setup and moral support. 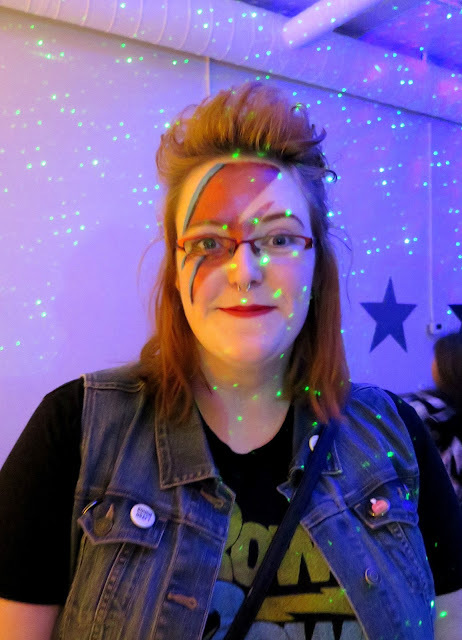 She even let me paint an Aladdin Sane lightning bolt on her face, a sign of a true friend who is not big Bowie fan. 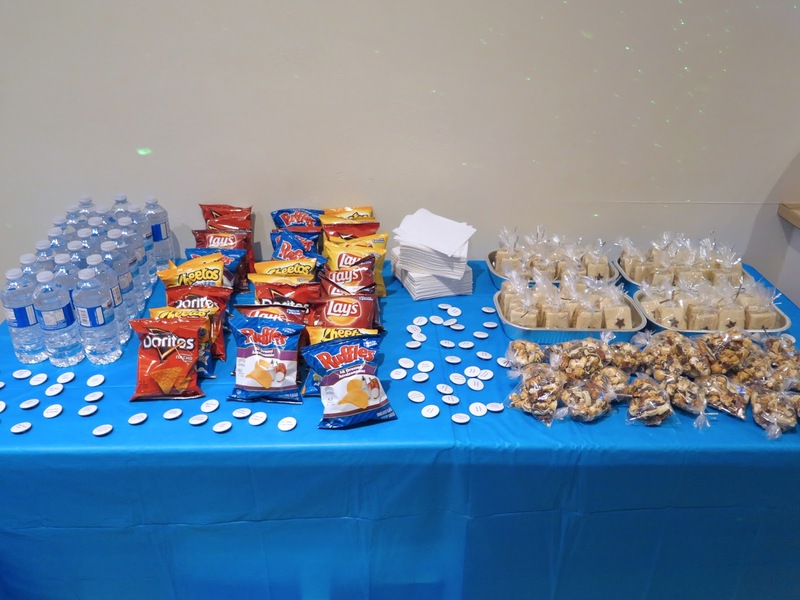 The snack table was loaded and ready to go. I made buttons with Bowie song titles and lyrics for people to take home as souvenirs. 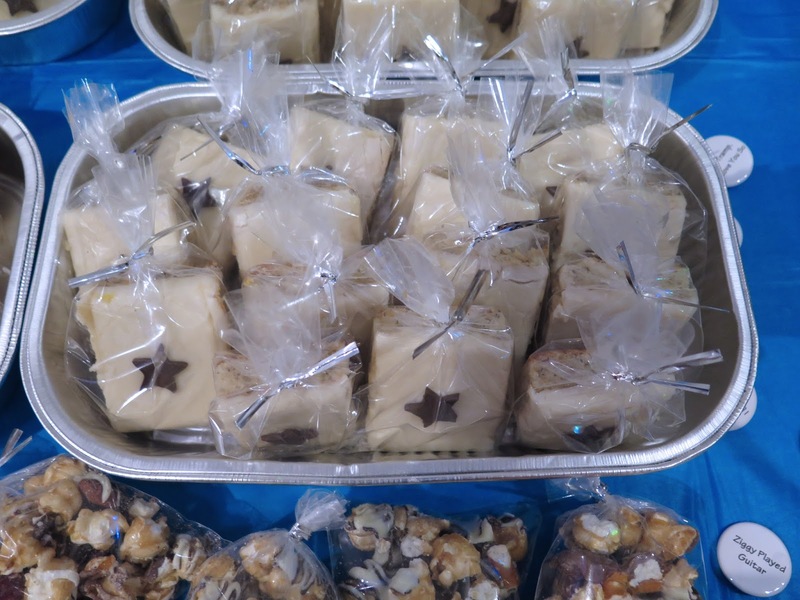 A work colleague made banana brownies for a bake sale we had last fall, and they were sooo delicious, I hired her to make them for the party, and figured if we added a chocolate star, we could call them Bowie Black Star Banana Brownies. They went over very well, and I encouraged people to take some home for their friends. Grace Grant and her dad set up her equipment and did a sound check before we opened the doors. I love that Grace dyed her hair orange to go with her costume from the "Life On Mars" video. 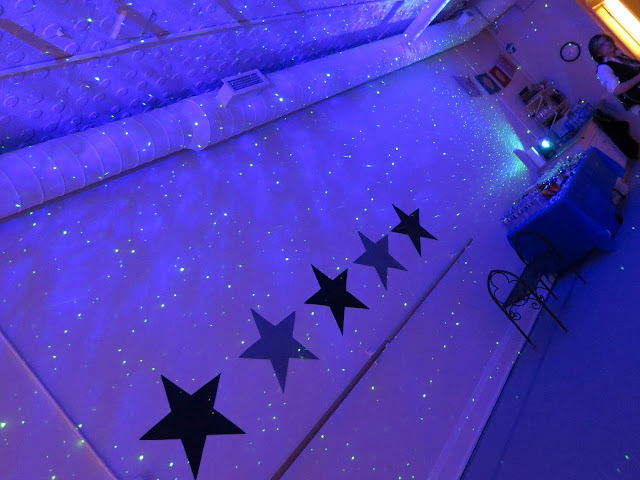 Jim Telfer, owner of Grafica Event Planners and Splash Home Decor, graciously loaned me a couple of laser lights that created a cool Space Oddity atmosphere. 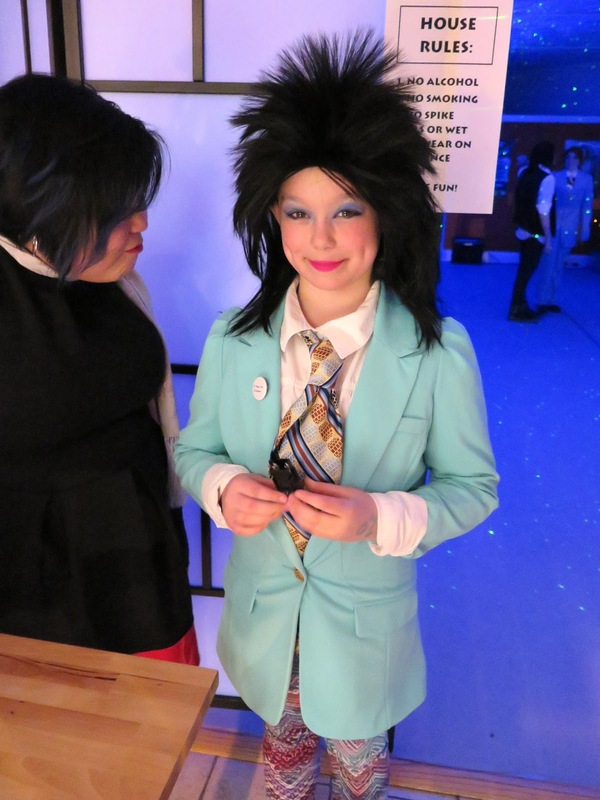 One of the local roller derby girls brought her daughter Keira, who when she found out there was a costume contest, put together the most adorable Bowie outfit. She was the hit of the party, and aside from Grace and I, the only other person who came in costume. Becca did a brilliant job on her Aladdin Insane face makeup which won her a prize package donated by Jackpot Vintage and Shakin Katz Radio. Prizes had also been donated by From Mars and Grooves Record Store. 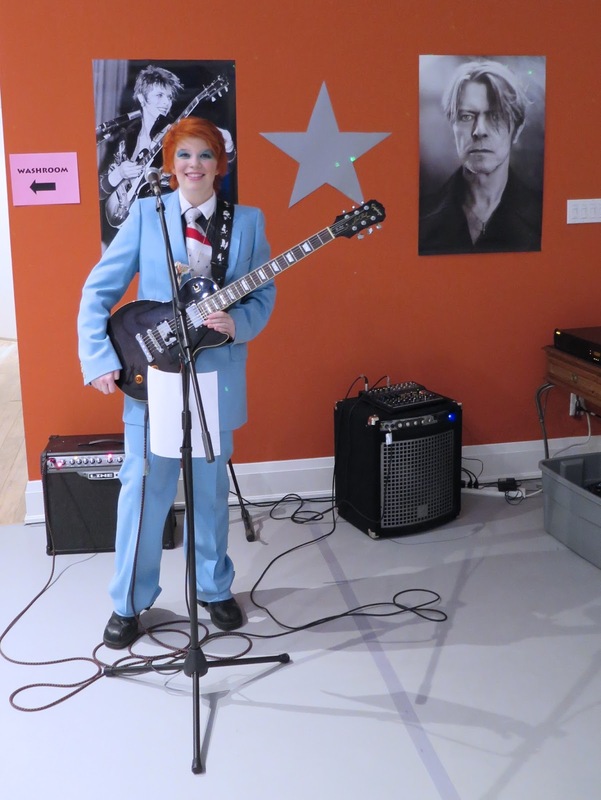 Grace Grant put on a spectacular performance, celebrating the music of David Bowie with a set list that included Space Oddity, Quicksand, Kooks, and Ziggy Stardust. Thank you so very much to Grace Grant, the people who donated prizes and otherwise helped out, and those of you who came to the party. Think of the event as a thank you party for all the support you've shown me over the years. wouuu, this is the kind of party one should never miss!, I'm loathing all those long miles (and one big ocean) which separate me from your party! Everything looks really amazing, funny and very Bowie-appropriate, all the costumes, make up and decoration, even food looks starrylicious! And you look absolutely wonderful!!! That's the kind of party everybody remember through the years and it's even more fabulous everytime they remember! Wow, sorry we missed it, such a thoughtful and lovely party! Well if I didn't live so far away I would have come! Loved the people in costume. Congratulations - you had 35 people who showed up because they really wanted to be there! And it was a great party! You showed a lot more gumption just putting it together than most people would have done. You are a Star (wo)man! I once had a New Years party on a night the weather turned really bad. Only four people came. It still might have been fun but they were not my favorite people - and one of them brought along a guy called Crazy Ed. So your 35 is fantastic! Yup, I say it too - 35 is more than I would have had. The very best party I went to in my entire LIFE? Three people, lots of food. Your costume is awesome, and Heather's, Keira's, Grace's and Becca's. I would have spent half my night dancing like mad; the other half draped all over the goody table. It's great to see how business had your back too. The question that I have is, what's wrong with London that they didn't crash the gates?! Doh! Pfft. Glad to hear you're getting better every day. WTF? If I could have come, I would have brought my Winesday crew - that would have been 15-20 people right there (and we party like double that!). Sorry to hear about the turnout, but that's still a decent number and everyone looks amazing! I love all your little goodies and grab-bags! You looked awesome too, Shelley - love your fabulous outfit! Looks like an amazing party! I'm only sorry I am too far away in the UK to have attended. The photos are great, and so are the costumes. I didn't know you could paint - your face paint job is excellent! And where ever did you get the black stars to put on the brownies? Looks like you planned everything right down to the last detail, and they ARE great details. I too am sorry we couldn't attend! I also would have come if I weren't on the other side of the continent. Funny--this morning I am worried about a lecture I was asked to arrange where I work tonight--maybe not many will show up to that either. I had the flu too--despite getting a flu shot! The immunization maybe shortened the period of fever and intense illness, but more than three weeks later, I have lingering symptoms. This year's bug was a doozy. Good luck with your recovery! Jon & I would have been there if we didn't live an ocean away. You looked incredible and those that came along also looked utterly brilliant, the snacks and goodie bags were amazing. I wish you would have come to the party - that would have been great to meet you! You're a Rocket Girl! 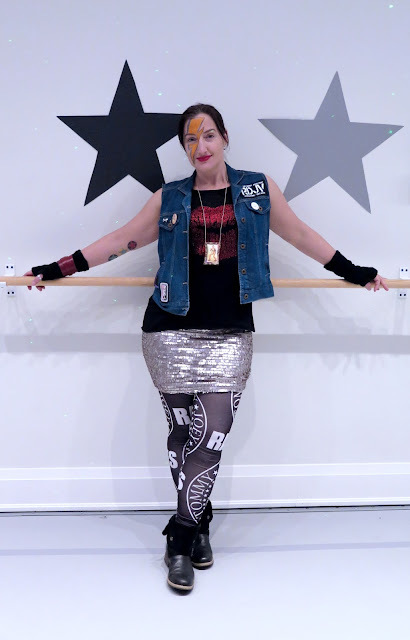 What a great ensemble you put together, a Bowie Roller Derby Rocket Girl, I do believe. Kudos to you, for putting such a 'do' together, man. Down to the smallest detail, everything looks grand. 35 attendees sounds like a crowd to me. You really are someone who makes it happen. I'm down on my knees to you, babe. I would have loved to have been at your beautifully planned party! Your costume was magnificent. In my book you always have been, and are a star! Wish I could have been there, as the dance floor is my favorite place to be. You honored Bowie in style! Congratulations. Hope that you continue to recover and are back to your wonderful, beautiful and creative self. Oh my Shelley what a lot of work... I am always far too lazy for such things. Brilliant of you to organize this. And looking darned good too.